Indication for extracorporeal shockwave therapy is plantar fasciitis that has failed to respond to adequate, non-operative treatment over a prolonged period of time. Extracorporeal shockwave therapy involves delivering a wave of acoustic energy like a high powered sound wave, or shockwave, into the soft tissue in the area of the plantar fasciitis. This is very similar to what is used to break up kidney stones. These waves cause a localized injury to the plantar fascia where it attaches to the heel bone (calcaneus), and where the inflammation and irritation that create the plantar fasciitis symptoms are located. The response to this injury includes the body sending increased blood flow and inflammatory mediators into this area, and these are thought to help improve or resolve the symptoms of the plantar fasciitis. Essentially this technique involves stirring up the soft tissue to create a healing response, which then leads to improvement in symptoms. There are two broad categories of extracorporeal shockwave treatment. The first is high-energy shockwaves which are quite painful and therefore patient’s need to undergo some type of anesthetic either general anesthetic or a local field block. The second is a milder lower intensity shockwave that is performed over a longer period of time and maybe performed over multiple sessions. This does not require an anesthetic but there are some questions as to its efficacy. Specific advantages of shockwave treatment are the fact that there are few if any, long-term side effects or permanent changes associated with its use. No scars and no risk for infection. Disadvantages include pain associated with treatment (particularly high energy) and possibly lower effectiveness compared to other options. When a high-intensity shockwave therapy is administered to the foot, it is quite painful during the recovery period. 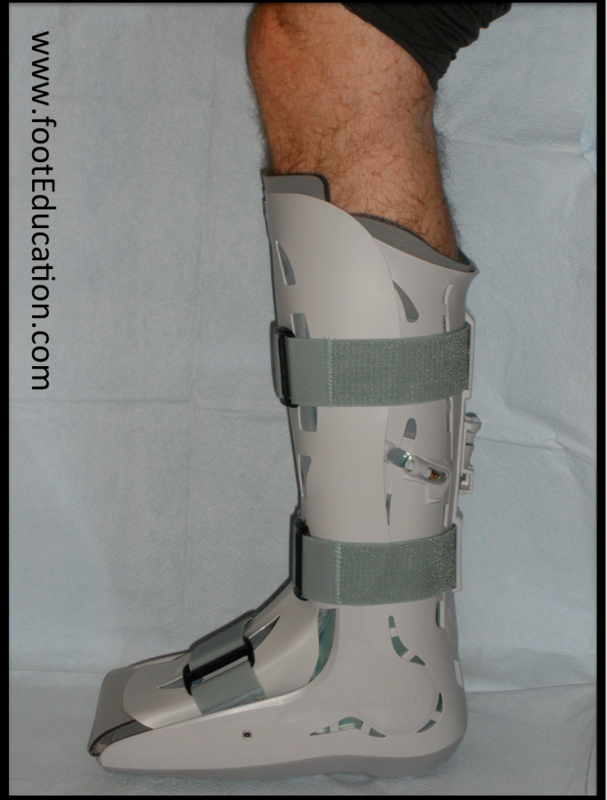 Therefore patients are encouraged to keep the foot immobilized in a walker boot, and to be non-weight-bearing or minimal weight bearing until their symptoms have improved. This time can vary from a few days to a few weeks. Pain. Even though this procedure does not break the skin, it does create significant microscopic tissue injury that can be quite painful. In response to this tissue damage, there is often significant initial pain, which should resolve over the ensuing weeks. Recurrence of symptoms or failure to irradiate the symptoms. There remains unresolved questions as to the ultimate effectiveness of this treatment, particularly the lower intensity treatment. Reasonable short-term results have been demonstrated over three to six months following this type of procedure. However, the recurrence of symptoms over time is not insignificant. One of the issues is that the tissue still remains damage. Furthermore, ESWT does not address the factors that predispose to the development of plantar fascists, such as a tight calf muscle; a job that requires prolonged standing; or excessive weight.